The career in the medical sector isn’t for the faint-hearted. It’s not just the doctors and surgeons who have to deal with crazy work pressure and long shift duties. The registered nurses, medical interns, assistants and others part of the general nursing body of a hospital, clinic or community center have to put in equal amounts (if not more) of effort. Compassion, communication skills, resilience and respect, accountability and adaptability – a good nurse has all these daunting qualities. The nursing staff forms an indispensable part of the healthcare community; they are the backbone of any hospital. Recruiters reveal what they ask when hiring new staff and the answers they hope to hear. Use these questions to prepare for staff nurse interview and give in your best shot. Why do you want to work in the healthcare sector? This is one of the most common questions asked in an interview. The employer wants to gauge your sincerity and passion towards the healthcare sector. Now, most candidates would express their lifelong interest in the field and how they love serving the sick and suffering. Don’t babble on and on about the emotional quotient of the job. Talk about why you love the job and how it is a professionally and financially lucrative option for you. A medical field is a popular option for many candidates and the newly opened staff nurse vacancies only add on to the appeal of the profession. What do you think is your biggest weakness? Listing down your strengths is an easy task but being honest about your downfalls, that takes courage. Introspect and make a list of things you probably need to improve or change in yourself on the professional front. If asked to state a weakness, think of a developmental need that needs addressing. The employer understands how you are aware of your problem areas and are willing to work on them. For instance, you can talk about how you lack the experience or technical know-how regarding certain procedures and that you’re taking lessons/help to develop the same. What do you think are the most important character traits of a good nurse staff? The employer wants to know what you feel an “ideal employee” should be. Don’t go about throwing every positive adjective in the dictionary. Instead, be very pragmatic in your answer. Talk about empathy, kindness, compassion, flexibility, hard work, sincerity and passion. Also, mention the practical skills, academic knowledge and technical experience required for the job. Then move on to point out how you possess most of the aforementioned qualities and can contribute to the organization. How do you perceive “cultural diversity” in the workplace? Now, this is a tough question. There are all kinds of people visiting and working at a hospital, irrespective of their religion, caste, race or gender. When the interviewer asks you to express your views on cultural diversity, he is looking for an answer that’s more than just stating how you’d “treat everyone the same.” Don’t simply give out sermons on tolerance, secularism, and equality. Present a professional answer, mention snippets and stories from your personal experience that addresses the issue. Describe your previous workspace and employer? 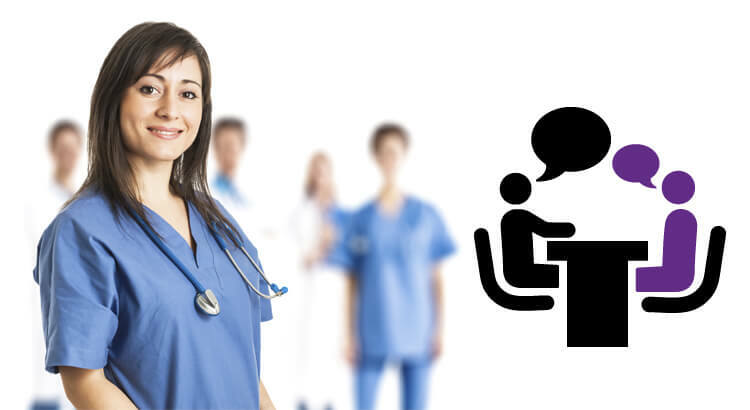 Having some experience in the healthcare sector is a big plus point for any candidate. Here, you can talk about the projects you’ve been a part of and the doctors you’ve assisted in the past. Hiring managers are trained to spot the inconsistencies in your CV, so be as honest as possible. Also, present only the positive aspects your previous workspace. Don’t criticise your previous employer or colleagues, instead, talk about how they shaped you the way you are today. Have you dealt with conflict in the past? As a nurse staff, you have to witness more than your fair share of conflicts in the workspace. Mention an incident or two where you were a part of or had to witness a conflict first-hand. It might be an argument among the colleagues or a discord in the higher management. Describe your role in the situation and how you helped to ease the tension. The interview wants to see how you can de-escalate a situation using basic resolution strategies such as talking to both the parties separately, finding the root cause of the issue etc. How would you describe your primary duties as a staff nurse job? Nursing staffs are an important figure in any hospital as they are responsible for all the background work involved. Your primary duties as a working staff include monitoring the patients under your care and tracking their condition. You’ll have to help the patient recover, give them their medications on time, take care of their meals, hygiene, be available whenever needed and chart their progress systematically. How would you track a patient’s progress? The chart records the patient’s progress during his stay in the hospital. Every day you will have to take their samples, send them in for testing and analyze the reports to deduce their condition. You have to monitor the vital signs and be on the lookout for for symptoms of potential illness and infections that the patient might catch. This progress is then reported to the physician on duty. What would you do if given a difficult patient who refuses to cooperate with you? When presented with a hypothetical situation like this, you need to really think and analyze your response to it rationally. Don’t rush to answer how you’d be sensitive and gentle towards the patient. First talk about how you would approach the problem, try to understand it and then look for a solution. Mention how you would call in for help in case the situation goes out of hand. How would you deal with a rude senior (doctor or nurse)? A rude senior who refuses to cooperate with you can be a bit of a problem for a nurse staff. You cannot break the code and retaliate with the same hostility. Instead, you must keep your cool and try to politely, but firmly, put forth your case. Gather your colleagues, get help and if need be get the higher authorities involved. The interviewer wants to check how calm, collected and practical you are in case of a conflict. The panel here is analyzing your stress management skills. How would you confront and console a disturbed family relative? One of the toughest aspects of working in a hospital is when you have to deal with the relatives of a patient. They are obviously worried and constantly asking for updates on their loved ones. Family members are to be contacted during emergencies. At other times, you can consult them to decide the best course of treatment for the patient. Be firm yet gentle in breaking down the bad news to a family member. How would you handle an emergency case? The emergency cases are generally directed to the senior staff and professional doctors of the organization. However, there are a few basic things you can do to ensure immediate relief for the patient. Mention incidents where you had to assist doctors in treating severe burns, major surgeries or fatal accident cases. Talk about how you were calm and collected during the ordeal performing all your tasks meticulously. What do you think makes a good shift? A good shift doesn’t necessarily translate to a huge number of staff catering to patients and scuttling around the wards. The interviewer here wants to hear about how diligent, versatile and adaptable you are in the given circumstances. Talk about delivering safe effective care and documenting the same systematically. A bad shift is not when there’s a shortage of staff but when you are unable to give in your 100% to the organization. Also, it is here that you can mention the importance of breaks, developing interpersonal relationships with your colleagues and being involved in group activities. Most candidates refrain from asking any questions, that’s not a great way to wrap up the interview. The employer is giving you a chance to put forth your views and open up about any doubts or queries you might have regarding your job, use this opportunity well. Prepare a list of questions beforehand on the working shifts, duties and other details of your employment. The nursing career is perhaps the most coveted of career options for new grad staff nurses and cracking the preliminary interview stage is your first step towards achieving that goal. Reflect on the questions thrown at you and take your time to formulate a logical response to the same. Keep your answers crisp and to the point to assert a determined, focused and confident persona. Good luck!